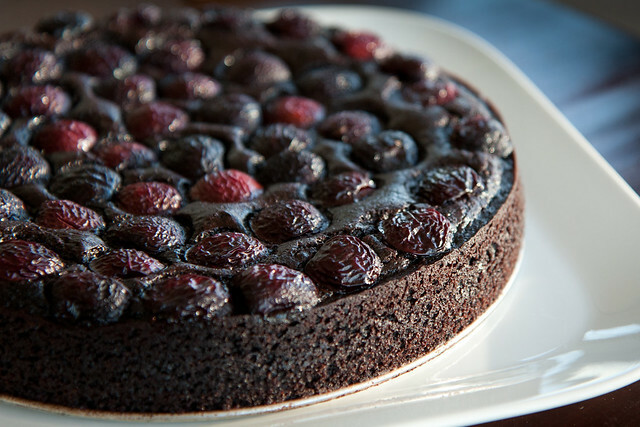 Last night for a potluck I made a chocolate cherry cake out of cooked quinoa with no flour whatsoever. The recipe is adapted from a recipe I found online that is credited below. I'm excited about using quinoa this way for baking, and will be attempting some muffins and/or cupcakes in the future. There might also be a possibility for making it vegan (perhaps with coconut milk & oil) but I'm partial to real (organic!) butter and eggs. Bring quinoa and water to a boil in a medium saucepan. Cover, reduce to a simmer and cook for 10 minutes. Turn off the heat and leave the covered saucepan on the burner for another 10 minutes. Fluff with a fork and allow the quinoa to cool. Preheat oven to 350 F. Lightly grease two 8-inch round or square cake pans, or one springform pan. Line the bottoms of the pans with parchment paper. Pit cherries by cutting each in half and removing the seed. Set aside. Combine the milk, eggs and vanilla in a blender or food processor. Add 2 cups of cooked quinoa and the butter and continue to blend until smooth. Combine sugar, cocoa, baking powder, baking soda and salt in a medium bowl. Add the contents of the blender and mix well. If using two pans, divide the batter evenly between them. 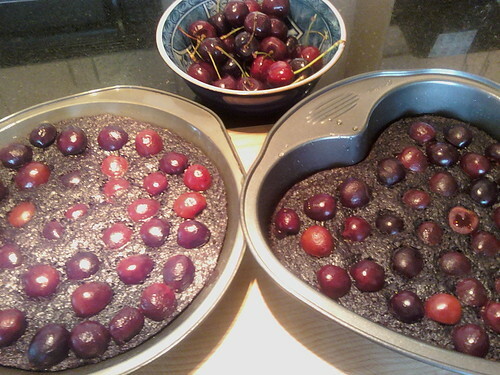 Bake on the centre rack for 20 minutes, then carefully top with cherry halves. Bake for another 20 to 35 minutes, or until a knife or toothpick inserted in the centre comes out clean. Cool completely in the pan before serving. Glad you have time and inclination to bake. Who knew Quinoa could be a dessert! This dessert is spectacular! Loved it at your potluck, and made it for my sister recently. The recipe’s a keeper. So many people are asking questions about quinoa!! I’m happy to have found this photo from veggiefrog. It took me awhile to track down your recipe, but the rewarding recipe looks good enough to eat :-) I’ve brazenly borrowed the photo and the recipe and posted it on Cool Grey Matter. Thank you!